The right custom labels can go a long way toward boosting these businesses' stature in the marketplace, especially as more consumers become health-conscious. March is National Nutrition Month, acting as a time for consumers to think about how healthy their diets are, and what they can do to improve their eating and drinking habits. Companies that manufacture, distribute or sell food- or beverage-related items should leverage National Nutrition Month to raise awareness regarding the benefits of a nutritious diet, the importance of this month's event and the healthier aspects of the brand's products. 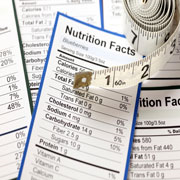 Custom food labels can help brands align their names with National Nutrition Month. One of the most affordable ways to do this is to design and print custom labels that concisely convey nutritional benefits and information in an aesthetically pleasing fashion. The driving force behind a custom labeling strategy this month should be to raise awareness regarding the best practices of a nutritious diet. By focusing on the specific nutritious qualities of the products being displayed and sold by each company, the labels bring to light the reasons a health-conscious consumer should be considering these products. For example, with custom beverage labels, rather than only pointing toward the flavor of the products, the stickers can convey what the healthiest aspects of the drinks might entail, such as low sodium, high vitamin C content or other healthy call outs. "Food manufacturers, distributors and retailers are given a unique opportunity to align their corporate images with a highly popular event this March," said Lightning Labels Director of Business Development AnneMarie Campbell. "The right custom labels can go a long way toward boosting these businesses' stature in the marketplace, especially as more consumers become health-conscious." To ensure individuals in the stores make the connection between the brand and the event in March, business leaders want to ensure their designers and marketing teams are incorporating a nod to National Nutrition Month. With March already underway, companies will need to get moving on their custom labeling strategies as soon as possible. Selecting a custom sticker and label vendor that can fulfill orders quickly and accurately is critical. National Nutrition Month is an opportunity to drive brand recognition and subsequent revenue throughout the rest of the year, and should be a priority in the coming weeks for all relevant organizations. Lightning Labels uses state-of-the-art printing technology to provide affordable, full-color custom labels and custom stickers of all shapes and sizes. From small orders for individuals to the bulk needs of big businesses, Lightning Labels is equipped to handle and fulfill custom label and sticker projects of all types. Best of all, like the name implies, Lightning Labels provides a quick turnaround for every customer's labeling needs. Uses for Lightning Labels' custom product labels and custom stickers include food packaging and organic food labels, wine and beverage labels, bath and body labels, and nutraceutical products, such as vitamins, essentials oils, and herbal remedies, as well as event stickers, adhesive window stickers and more. Lightning Labels strongly supports the development of environmentally friendly printing materials and carries EarthFirst PLA, a new kind of green label material made from corn instead of petroleum. While operating as a high-tech printer, Lightning Labels prides itself on its personalized customer service. Lightning Labels provides one stop shopping for all of your custom label needs. For more information and to place orders online, visit http://www.LightningLabels.com. For the latest in packaging news and labeling promotional offers, find Lightning Labels on Twitter (@LightningLabels), Facebook, Pinterest, Google+ and LinkedIn.